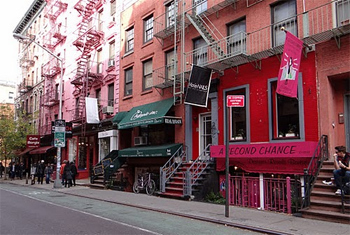 Typical SoHo Street, lined with European style coffee shops and consignment stores. photos by Megan McDonough. I remember the first day I arrived in New York City like it was both yesterday and a lifetime ago. Two weeks out of college, I had managed to find a cheap apartment in Manhattan’s vibrant Lower East Side. Despite being completely lost and entirely out of my comfort zone, I managed to explore my new surroundings that first day. In true New York Newby fashion, I found myself lost within minutes yet just as Alice crawls through the rabbit hole that leads her to Wonderland, I also emerged into a colorful and much cleaner neighborhood – SoHo. A year later, I was an official SoHo resident. One of the best things about SoHo is its location. If you walk straight across either Broome or Grand Streets from West to East you will pass through Little Italy, Chinatown, the Bowery and the Lower East Side. Each neighborhood has a completely unique energy and personality, throwing different cultures at travelers at every angle. 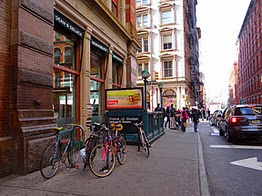 If you walk south of SoHo, you enter the popular neighborhood of TriBeCa (Triangle Below Canal Street). During the warm weather, a ten-minute walk west of SoHo takes you to the Hudson River where you can walk and talk with friends as you stare ahead at the famous Statue of Liberty. North of SoHo takes you through the NYU campus grounds, Washington Square Park and lively Bleecker Street. A common misconception among first-time travelers to New York City is that SoHo is only worth a visit if you are in the mood to shop. While Broadway does primarily consist of chain fashion stores, a surplus of Starbucks cafes and of course street vendors who make a living out of over-pricing their items and selling them to non-assuming tourists, there is a world much more international and eclectic once you leave the overcrowded street. Bikes parked all day in SoHo. The first thing I noticed about this neighborhood is a number of languages spoken by locals. While New York City is the melting pot of the world, in many ways SoHo is a melting pot for New York. Influences of Europe are seen at every street corner; from the French-styled coffee shops to the high-end boutiques and the hole-in-the-wall bookstores, this neighborhood is brimming with life, culture and contagious energy. If you only have three days in New York, here are some must-see places to experience in SoHo. This easily became my favorite coffee shop in SoHo. During the winter, this is the perfect spot to escape the cold and enjoy a nice cup of hot chocolate or their delicious hot apple cider. When the warm weather returns, snag a seat outside and fell like you are back in Paris as you people watch along Prince Street. The name gives itself away. This small coffee shop is home to SoHo locals from around the world. Although it’s not the ideal location for a large party, you can usually find a lone chair or two-top table to sit and enjoy your morning coffee and newspaper. Felix is a popular brunch spot in SoHo. For a quick coffee and a great view of West Broadway, Ground Support gives you both. The coffee shop is barely noticeable from the outside, but once inside you will find picnic tables covered with computers, notepads, newspapers and of course the occasional coffee cup. This is perfect for travelers who want some time to connect with family back home. To fully experience New York at a local level, you must go to brunch on Saturday or Sunday. If you are in SoHo, there is no better place to go than Felix’s notorious Sunday Brunch Party. The French bistro effortlessly resembles a traditional Parisian restaurant, especially when their classic-style French doors open during the warm summer months. 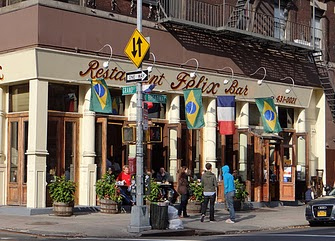 Just up the street from Felix is Via dei Mille, another very popular brunch spot that gives guests a little taste of Italy in New York. They specialize in freshly made pasta and fruity cocktails. This place fills up fast, so it’s best to either call ahead of time to check availability or to simply arrive before the rush of regular brunch partyers. If you still want to experience a New York City brunch minus the hangover the next morning, Sanctuary Tea offers a variety of breakfast and lunch options and an array of specialty drinks. Their Green Tea Margarita is a popular alcoholic beverage but they also carry teas from around the world for those just wanting to stop in for a quick bite. If you are in the mood for a quiet lunch, Antique Garage is just the place to sit back and relax. The small Turkish restaurant always intrigued me every time I walked by its doors. The interior is decorated with antique furniture and paintings, making this a vintage-lover’s prime destination for a weekend trip to New York. This Argentinian steakhouse is a popular restaurant for Latin Americans locals in the area or just for anyone who is craving a hearty steak and some red wine. Novecento is open for brunch, but the best way to experience their cuisine is during the dinner hours when you can better enjoy your meal. A relatively new American-style restaurant, The Dutch is quickly becoming a popular dinner and late-night snack spot for burger lovers and those who have had a little too much to drink and are looking to satisfy a late-night craving. Chef Andrew Carmellini runs the new joint’s kitchen. 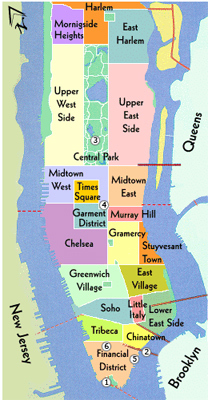 SoHo is in the lower left of this map of Manhattan's neighborhoods. Café Noir has been around for what seems forever and there’s no question as to why. This Mediterranean and Latin tapas restaurant first became my “local” simply because it was next door to my apartment. The sangria pitchers, mushroom risotto, and French fries kept me happy and always coming back for more. The café is perfect for a quiet lunch but it’s better known for their dance parties at night. If you are looking for a happy medium between local life and popular New York culture, grabbing dinner and drinks, Cipriani is just the spot. The famous Italian bar and restaurant have several locations throughout the city but this is the only location where the size won’t overwhelm tourists or locals. Even if you are not rolling in money heading to the Thompson Hotel Bar is one way to feel chic even if you are staying at a nearby hostel. The drinks are on the expensive side but the interior design and overall ambiance of the hotel and bar are worth paying an extra few bucks. Street Vendors: While SoHo is notorious for its busy Broadway retail chain stores, there is more shopping to be done at lesser-known shops. If you are looking for a good bargain, as I almost always am, it’s best to avoid the vendors selling items on the main strip and instead walk along Prince or Spring streets to find better deals. While many visitors are nervous to bargain with street vendors, I encourage travelers to give it a shot. I almost always leave paying less than the initial asking price. Discount Designer Stores: For shoppers who want to purchase coats, jeans, and dresses, there are several stores that are either going out of business and therefore eager to sell their items for a fraction of the cost. Many of these stores carry reputable designers who are trying to get rid of last season’s inventory. Consignment Shops: There are several consignments and vintage shops in the area including Second Chance, INA and Chelsea Girl offer designer clothes and rare accessory pieces at discount prices. SoHo was not always the hub of the art world. Before becoming a trendy sporting ground for the avant-garde, indie rockers, and eco-friendly bohemians, SoHo was an industrial area in Manhattan where goods from South Street Seaport were housed in huge warehouses. Art Galleries: SoHo doesn’t attract art and design fanatics for nothing. The neighborhood is teeming with local galleries of various artistic styles. Walking along Greene Street will take you past Animazing Gallery and Arcadia Fine Arts and down Broome Street travelers will find Broadfoot &Broadfoot and Broome Street Gallery. Design Stores: Beyond the upscale boutiques and trendy restaurants, visitors to SoHo will find famous design studios including Design Within Reach, CB2 and the MoMA Design Store. Smaller art galleries are found on most SoHo streets and are always welcoming art fanatics who are new to the area or just visiting for the day. Odd Stores: If you are looking for unique collectibles often seen only in museums, stopping into Evolution will spark your interest even if you don’t end up buying anything. The store sells framed insects, beetles and butterflies. Kidrobot is a quirky store that sells toys for adults in creative and sometimes surprising ways. 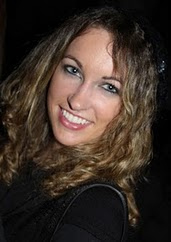 Megan Eileen McDonough is a New York City-based freelance writer, social media specialist and Founder of Bohemian Trails, an online travel magazine focusing on art, culture and off-the-beaten-path destinations.